Abu Jani Sandeep Khosla’s New Bridal Collection With Sonam Kapoor - The Latest Lehenga Trends Are Here! Abu Jani and Sandeep Khosla’s ‘Wedding of The Year’ was held on 21st July at JW Marriott in Delhi - and as expected, the show was beyond gorgeous! The entire collection was broken down into five parts to beautifully represent various wedding ceremonies - right from the cocktail and sangeet to the mehendi, ending with of course the grandest ceremony, the Shaadi. The collection is inspired by nature, the elegance of Paris, and the rose-tinted dream weddings brought to reality by ‘Shaadi by Marriott’ who were the venue-partners for the ABSK show. 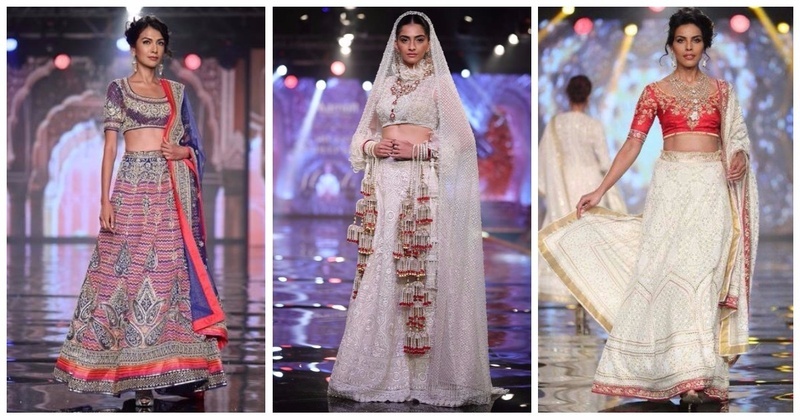 The specially curated 5-part fashion sequence brought alive the traditions and majesty of an Indian wedding. The designers played with a number of colours for all other sequences, settling on an all-white theme for the shaadi sequence. Sonam Kapoor walked the ramp as showstopper and looked stunning as usual in her white bridal lehenga with a high collar, see-through sleeves, swarovski crystals and detailed white-on-white embroidery.